Save 10% on supplies with your VersaLink C405 purchase (available at checkout). Right out of the box, you'll count on the VersaLink C405 color multifunction printer to consistently and flawlessly perform the tasks that make your business work more efficiently. From IT-free installation wizards, to step-by-step configuration options, you're ready to go—hassle free. 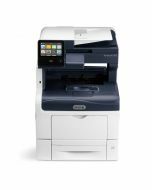 The Xerox® VersaLink C405 all-in-one printer is loaded with features and time-saving Xerox technologies designed to speed up information sharing and reduce inefficient workflows. Ensure information accuracy with Scan and Fax preview, and do more with scanned documents with built-in optical character recognition (OCR). When it comes to safeguarding critical documents and data, the VersaLink C405 delivers a spectrum of stringent security features, including Secure Print, Secure Fax, Secure Email, Secure Scan and card authentication to control access. With the VersaLink C405 multifunction printer, you can be confident that your documents will look their best—making you look your best—giving you the confidence you need when presenting to your customers. Preloaded Xerox® ConnectKey® Apps help optimize office efficiency, and on-screen access to the extensive Xerox® App Gallery provides expanded functionality — like the Xerox® Easy Translator Service app, which quickly translates scanned documents into numerous languages. The VersaLink C405 all-in-one printer gives you the freedom to work where and how you want—with available connectivity to Google Drive™, Microsoft® OneDrive® and DropBox™, and access to additional options through the Xerox® App Gallery. 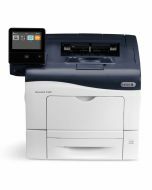 The ability to connect and print from multiple devices is key for today's worker, and the VersaLink C405 multifunction printer meets the challenge with optional Wi-Fi and Wi-Fi Direct, plus Apple® AirPrint®, Google Cloud Print™, Xerox® Print Service Plug-in for Android™, Near Field Communication (NFC) Tap-to-Pair and Mopria®. Product Size Dimensions (WxDxH): 17 x 21.3 x 23.6 in. ; Weight: 72 lb.